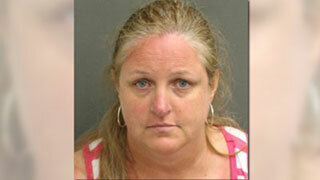 A Walt Disney World guest – a 40+-year-old woman -- is accused of choking a girl who was blocking her view at the Magic Kingdom fireworks show last week, according to the Orange County Sheriff's Office. The victim, visiting the theme park with a group of students and chaperones from her out-of-state high school, was with friends, waiting for the show to start. A family was sitting behind them. When the show began, the girl and her friends stood up so they could get a better view. The family sitting behind them told them to sit down so they could see, according to an arrest report. The girl and her friends decided to leave. As they were walking away, the victim told the mother of the family, "You can take our spot." Deputies said the woman, Tabbatha Mature (! ), 41, grabbed the girl by her neck, squeezed and pushed her head toward the ground. Mature let go of the girl when she started screaming and told her, "You don't want to mess with me," according to an arrest affidavit. The victim's friends got the girl away and found a Walt Disney World employee to report the incident. The girl did not have visible injuries. She told deputies she was willing to press charges. Mature was arrested on a child abuse charge.